What about putting a pipecleaner that you'd get at a craft store inside instead of a hanger? I have found that my boys refuse to sleep in the average sized cozy sacks. I make them new cozy's whenever I buy new fleece or carpeting and out of all the sacks I have made, they only sleep in the extra large sacks that are about the width of a pillowcase, but not very deep. I think the reason they enjoy this particular type is because it is very open inside, easy to move, turn, pancake in and get out of. My boys hate "tight" spaces so these are just perfect for them. To keep mine open, I do a top folding stitch and then fold the fabric once by hand as well. If you need an example, just let me know. amysanimals~ would love to see pictures of your cozy sacks that you made. Here are the most recent additions. As you can see, they are about the size of 1 grid, so 14 inches wide and deep. (Just a side note, the boys tonight touch the little side decorations, they really dont chew on anything besides KM's hay). Muffinface - That's what I thought was in it when you were here. It almost felt like a binder clip inside. Reeses decided to pose for me to show you all what I'm talking about. My mom and I talked about it and we decided we're going to re-enforce the cuff with extra thick batting. Here's some photos. As you can see, they are about the size of 1 grid, so 14 inches wide and deep. Anyway, the boys really seem to like the extra room and the lighter colors. I think they like the illusion of being covered from "the wild" of their bedroom, but also appriciate being able to see their surroundings and move about as they please. I guess thats what I get for having two snobby little porkchops. Actually, WindeSpirit uses a length of bendy wire inside the cuff of her saks (at least the ones I have) to prop them open. The trick is getting the wire to not bunch up inside the cuff after repeated washings. Mine did, and now they don't stay open anymore. :( But it was SO HANDY while it lasted! Problem got solved! I know not many of them were made but for yourself and anyone else who might have the same problem, any that would like to send theirs back to get fixed may do so and I'll ship them back free of charge. Or, $10 off next order. I'll cross post this to my thread in the Guinea Pig Related Products as well. I'm a new guinea pig person and right now my piggies are in a wooden hideaway. 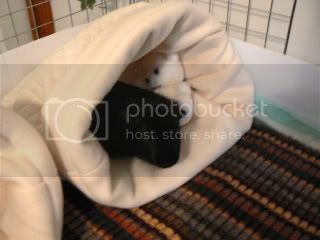 Does anyone substitute cozies for hideaways? Seems my babies would have more room if I tried adding a large cozy instead of the hideaway. 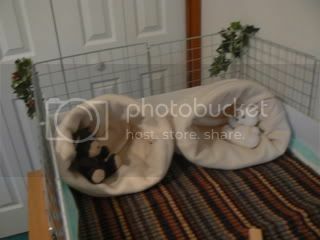 Does anyone substitute cozies for hideaways? Seems my babies would have more room if I tried adding a large cozy instead of the hideaway. I use single-step stools. That way the pigs can interact with what is going on around them yet feel "safe". It also provides more ventilation.